In the run-up to the Lok Sabha elections, the Parkash Singh Badal-led state government is going to start another welfare scheme, Bhagat Puran Singh Sehat Bima Yojana, that it had promised in its assembly poll manifesto. 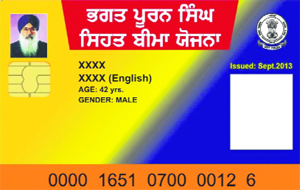 Like other welfare schemes in the past, this time too the state authorities have kept a slot on the top of the health insurance cards for the picture of Chief Minister Parkash Singh Badal. Water in most of the flood-hit villages in the district has receded. But, it will still take some more time before life returns to normal. Villagers engaged in rebuilding exercise are facing hardships due to recent rain in the region. For Balraj Singh and his family members, this festival season holds no significance. He is busy these days in repairing his house, which he had built just about two months ago. But, the recent rain has left them shattered. Chief Minister Parkash Singh Badal today defended Chief Parliamentary Secretary and real estate developer NK Sharma over the alleged violation of rules for his mega housing projects in Zirakpur. "The government has not received any complaint in this regard," he said. The Greater Mohali Area Development Authority (GMADA) has approved 15 acres of land for setting up of National Centre of Excellence for Animation, Gaming and Visual Effects at the Knowledge City in Mohali. In a first-of-its-kind decision in Punjab, the Phoolpur Panchayat has passed a unanimous resolution to run the village government primary school at its own expenses. The Sikh high priests may deliberate on the issue of Jatinder Singh Sayali challenging the authority of Akal Takht in the Delhi High Court with reference to the controversy surrounding the proposed 1984 Sikh genocide memorial in New Delhi. The Sikh clergy will meet here tomorrow. Balwant Singh Rajoana, the death-row convict in the Beant Singh assassination case, has decided to field his sister Kamaldeep Kaur from Patiala Lok Sabha seat against Union Minister Preneet Kaur. After defending him in the Punjab and Haryana High Court on his appointment as Chairman of the Punjab State Warehousing Corporation, the Punjab Government has now paved the way to bail out Moga MLA Joginder Pal Jain and his family members from the charges of raising an unauthorised colony. Five persons were injured in firing between two groups reportedly over a property dispute in Kot Harnam Dass area here today. One of the injured, Harpreet Singh Bholi, sustained serious injuries and is under-treatment at a private hospital. Among the other injured are Gurmit Singh, Sajjan Singh, Jagdeep Singh and Sarabjit Singh. In the run-up to the Lok Sabha elections, the Parkash Singh Badal-led state government is going to start another welfare scheme, Bhagat Puran Singh Sehat Bima Yojana, that it had promised in its assembly poll manifesto. Like other welfare schemes in the past, this time too the state authorities have kept a slot on the top of the health insurance cards for the picture of Chief Minister Parkash Singh Badal. The scheme entails Rs 30,000 health insurance to 15.4 lakh people enrolled under the state government’s atta-dal scheme. Though the scheme has been named after Bhagat Puran Singh, the founder of Pingalwara who worked selflessly all his life for the cause of mentally and terminally ill patients, his photograph has failed to find any space on the smart card to be issued among beneficiaries. Hussan Lal, Managing Director, Punjab Health Systems Corporation, said, “The scheme will be started across the state on November 11. Two insurance companies have been engaged to cover all blue card holders… As the scheme is entirely state sponsored, the cards will carry the Chief Minister’s photograph.” The Health Department has even uploaded the final design of the card on its official website. Earlier, the state government had put Badal’s photos on ‘108’ ambulance vans, bicycles distributed among girl students under Mai Bhago Vidya scheme, ration cards and portal of Direct Benefit Transfer scheme. The Chief Minister’s pictures on the ambulances — the scheme was partially funded by the Centre — had led to a war of words between the Akalis and the Congress leaders. A senior official said there was nothing wrong in using Badal’s pictures on any state government-funded welfare scheme but these would have to be removed once the election code of conduct came into force. Even during the 2012 assembly elections, the pictures had to be removed from the ambulances. Water in most of the flood-hit villages in the district has receded. But, it will still take some more time before life returns to normal. Villagers engaged in rebuilding exercise are facing hardships due to recent rain in the region. For Balraj Singh and his family members, this festival season holds no significance. He is busy these days in repairing his house, which he had built just about two months ago. But, the recent rain has left them shattered. Balraj owns three acres of land. He has taken a debt of Rs 1.5 lakh from his relatives to repair his house. "I had built this house with all my savings. But, it got damaged again. 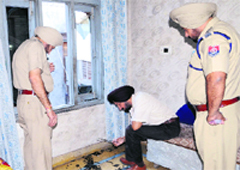 Household articles like television and refrigerator have also gone out of order," said Balraj showing big cracks on the walls of his house. "We are in dire straits. The government must give us compensation," he added. Like Balraj many others in this village, which is worst-affected by waterlogging, were seen reconstructing their houses. Some of them were even found living under canopies as they were awaiting compensation to start reconstruction. Jagmeet Singh, whose house is located on the village's periphery, said: "I returned to my village today. When we left the village, the area was under 4-feet water, which has now receded. But, our house has been badly damaged. It is stinking. It will be very difficult for us to repair the house on our own". A labourer, Jaspal Kaur, who along with five members of her family is living in a canopy, said: "Crops have been damaged and there is no work in the fields. My husband is working as a mason, but I am still struggling to get work". Village residents have demanded the construction of a drain. They said in case of more rain, their survival would be in peril. They are wary of bringing their livestock back from safer places due to the fear of outbreak of some disease. Dr Sanpreet Kaur, who is medically examining villagers, said: "A number of those who turned up for a medical check-up were suffering from various skin infections". Villages said the Chief Minister had assured them of free power supply for the next six months, but they were still getting the bills. "Our paddy and cotton crops have damaged. We are even unable to sow wheat since the fields are still wet," said Bohar Singh. Even after two months of rains, the fields at Khokhar village are still waterlogged. Sukhdeep Singh, a village resident, said: "Residents of the nearby Bhuttiwala village have created a bundh on the water channel. We have approached local MLA Karan Kaur Brar who has assured us to take up the issue with senior officials in Chandigarh". When asked that the Punjab Pollution Control Board has filed a criminal complaint in this regard, he said the information was confined only to the media. "Former Chief Minister Amarinder Singh had levelled similar allegations against me, which were later proved false," Badal said while interacting with mediapersons before inaugurating Art of Living's campaign "Volunteer for Better Punjab". The Chief Minister said the Centre had formally approved setting up a cancer hospital at a cost of Rs 450 crore at Mullanpur. The work on it would start soon, he said, adding that he had already written to Prime Minister Manmohan Singh requesting him to lay the foundation stone of the hospital. Badal alleged the Centre was responsible for illegal mining in the state since permissions for mining operations were being delayed by the central agencies. The work on the road from Anandpur Sahib to Chandigarh would be started soon, he said. Badal called upon the Centre to take measures to seal the international border with Pakistan to keep a check on drug smuggling. "Poppy husk in the state is being smuggled from Rajasthan where it is sold in the open market. The centre should ban it," he said. Badal offered Sri Sri Ravishankar to adopt some villages in the state to be developed as model villages. The state would extend all help and cooperation in this regard, he added. The institute will be set up under the Rashtriya Ucchatar Shiksha Abhiyan (RUSA). Additional Director (Technical Education) Mohanbir Singh said: "The Director (Films) in the Ministry of Information and Broadcasting has already approved the institute. A sum of Rs 52 crore has been allocated for the same. The state government has waived the external development charges". Talking about the proposal, Secretary (Higher Education and Languages) Dr Roshan Sankaria said RUSA aimed at increasing the institutional base of higher education by increasing capacity in the existing institutions and establishing new ones. RUSA aims at increasing enrolments in higher education institutions to 30 per cent by 2020 as against the current enrolments of less than 15 per cent. The panchayat headed by sarpanch Jaswinder Kaur took the decision to ensure the education of 30-odd tiny tots does not suffer. The Punjab Government had closed the six-decade old school and merged it with another school in Dhanal Kalan village, stating the number of students at the school was low. “While the students’ parents were too poor to arrange transportation for them to Dhanal Kalan School, located at a distance of 2 km, the children were too small to go on their own,” said social worker Des Raj. Built on six kanals of panchayat land, Phoolpur School boasts of a two acre playground for its students. The school has seven rooms, two bathrooms, a submersible motor for potable water and a kitchen for preparing midday meals. The school was formally inaugurated on Thursday by former MLA Jagbir Brar. Several local leaders were present on the occasion. DEO (Primary) Kuldeep Sharma said he would bring the matter to the notice of his seniors and act accordingly. Jalandhar Block Education Officer (BEO) Kuldeep Singh said the panchayat should have contacted the Education Minister before taking the step. Akal Takht Jathedar Giani Gurbachan Singh said all the documents pertaining to the case were being studied. The issue would be discussed tomorrow, he said. Sources said the Sikh high priests might summon Sayali for his move, besides summoning the "forces" behind it. Kamaldeep would fight the election as an independent candidate against the three-time Congress MP, Rajoana said in a letter written from the Central Jail here where he is lodged. The case was registered against him, his wife, two sons and a daughter on August 26, 2007, under the Punjab Apartment and Property Regulation Act, 1995, at Mehna police station in the district. The case is pending before the court of Suman Agnihotri, JMIC, here. Additional Chief Administrator of Greater Ludhiana Area Development Authority (GLADA), a subsidiary of PUDA, has moved an application before a local court demanding suspension of legal proceedings against Jain and his family. The court after receiving the application a few days ago has decided to hear arguments on October 22. If considered, it would be a big relief for the legislator. Five persons were injured in firing between two groups reportedly over a property dispute in Kot Harnam Dass area here today. One of the injured, Harpreet Singh Bholi, sustained serious injuries and is under-treatment at a private hospital. Among the other injured are Gurmit Singh, Sajjan Singh, Jagdeep Singh and Sarabjit Singh. Incidentally, all the injured belonged to the same group. Trouble reportedly began when the Raju Kothi Wala group allegedly attacked a Kot Harnam Dass resident, Jatinder Singh Raju, at the latter’s house. Jatinder’s mother Harjit Kaur alleged that a religious ceremony was underway at their house when her son was attacked by a group led by Raju Kothi Wala. “Raju Kothi Wala and his supporters, including one Sajjan Singh, opened indiscriminate firing at our residence with their pistols,” she said. Jatinder, who is absconding, too is learnt to have retaliated with his .12 bore rifle. Incidentally, all the injured persons belonged to the Raju Kothi Wala group. Harjit Kaur, however, refuted that her son had opened fired. Following the incident, senior police officials, including Deputy Commissioner of Police Kaustubh Sharma, rushed to the spot. Confirming that the violence occurred over a property dispute, Sharma said police investigations were on. “We are recording the statements and action will be taken accordingly,” he said.